We all need the right kind of support to achieve our goals. Here's a list of do's and don'ts for all the family, friends, and significant others out there looking for ways to help loved ones live (and thrive!) with diabetes. We've even got some quotes from PWDs on the One Drop team, sharing their favorite forms of support, as well as the kinds of "support" that drive them crazy! Enjoy. 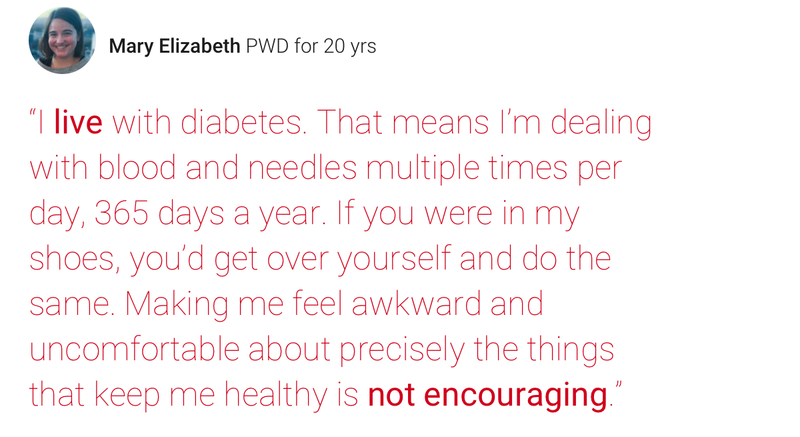 Diabetes management is a full- time job with no vacations and no pay. 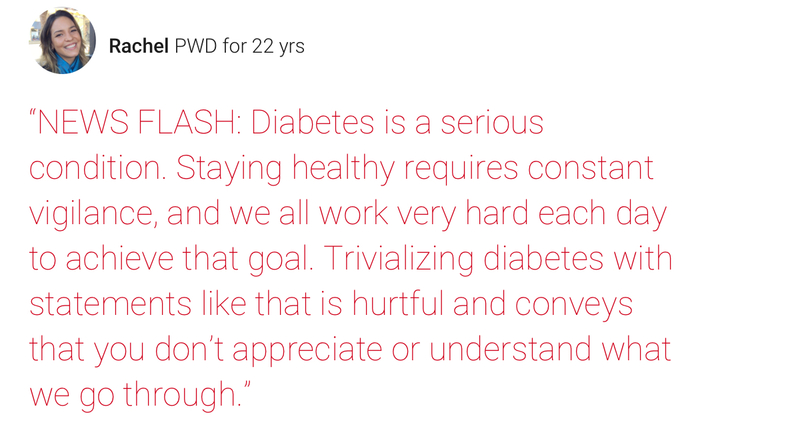 It’s important to acknowledge how hard your loved one works to deal with diabetes on top of all life’s other responsibilities. Offer to join your loved one for some physical activity, like a walk, Zumba class, or tennis game. Research restaurants serving healthy and tasty meals. When you do these things, it conveys that you and he/she are in it together. Bonus: Making these healthy lifestyle choices is good for you, too! Ask your loved one how he/she would like you to help out. And be sure to ask for specifics that are meaningful to them. You may think you already know, but it’s always good to double check! This helps to ensure that your efforts will be appreciated. Show you care by taking action. For example, give a hug, write an encouraging note, make a low-carb recipe... and always listen. By learning about diabetes, listening to your loved one’s concerns, and doing new healthy activities together, you are showing genuine concern and support, which goes a really long way! #5: Remember: Well-managed diabetes is the leading cause of nothing! We read and hear a lot about all the dreadful complications of diabetes, but these complications are usually avoidable with proper diabetes management. By doing all of the above to support your loved one in their self-care, you’re helping him/her stay happy and healthy for the long haul. Please don’t give orders. Instead of saying, “You should do X,” try “What do you think of trying X? Has anything like that worked for you in the past?” By approaching the situation like a partner in your loved one’s journey, you may learn more about why he/she makes certain decisions and come to better solutions together. As the old mantra goes, “Your diabetes may vary,” or “YDMV.” Everyone’s situation is different and what works for one person may not work for someone else. It never helps anyone to hear other people’s horror stories. 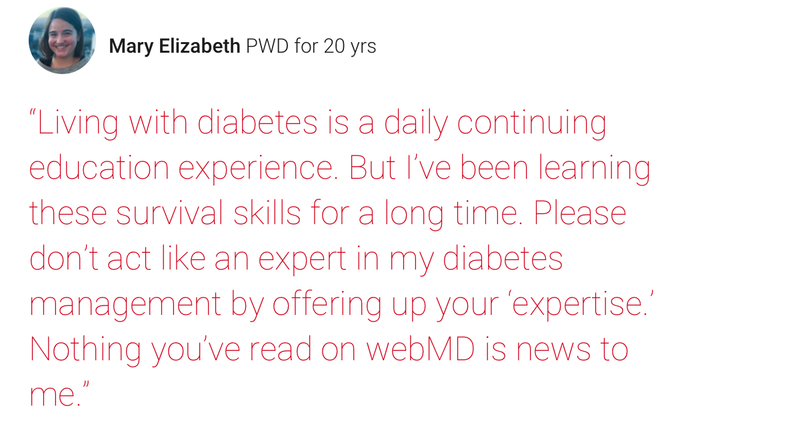 Unless diabetes is your field of expertise (i.e., you’re a licensed diabetes specialist), don’t give any medical advice. It’s dangerous and usually isn’t the kind of support your loved one needs or wants from you. If blood and needles make you uncomfortable, don’t say things like, “I could NEVER do that!” or “Oh my gosh! I can’t watch!” It’s hard enough to routinely stick yourself without feeling like you’re doing something that makes other people queasy. Don’t say things like, “It could be worse. At least it’s not fatal.” Statements like those are thoughtless and hurtful because they imply diabetes isn’t a serious condition. All forms of diabetes must be taken seriously to avoid and/or control the development of long-term complications. 5 Do's and 5 Don'ts for supporting your loved one with diabetes. Is there anything special you or your loved ones do to show support? Share your own tips with us here, here, or here!